For a license as popular as the Game of Thrones, there's not a lot of stuff out there right now. I'm assuming Funko is still doing a few Pops, but their second shot at a more traditional action figure line appears to have gone down in flames. There's very little in the way of traditional busts or statues. 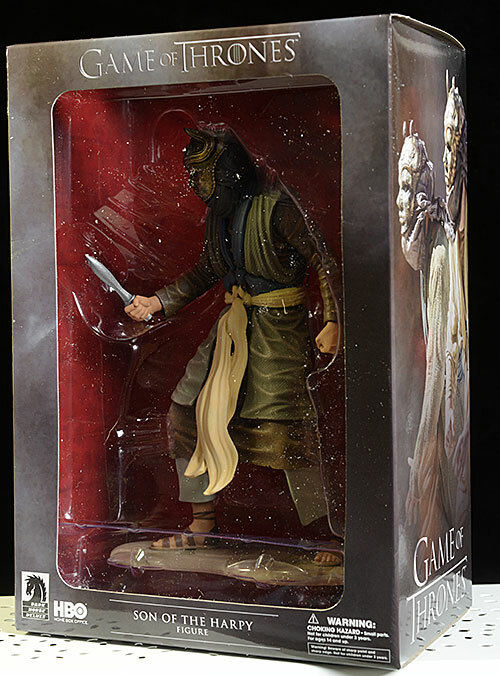 The sixth scale line by ThreeZero is great, but they tend to move at a glacial pace. 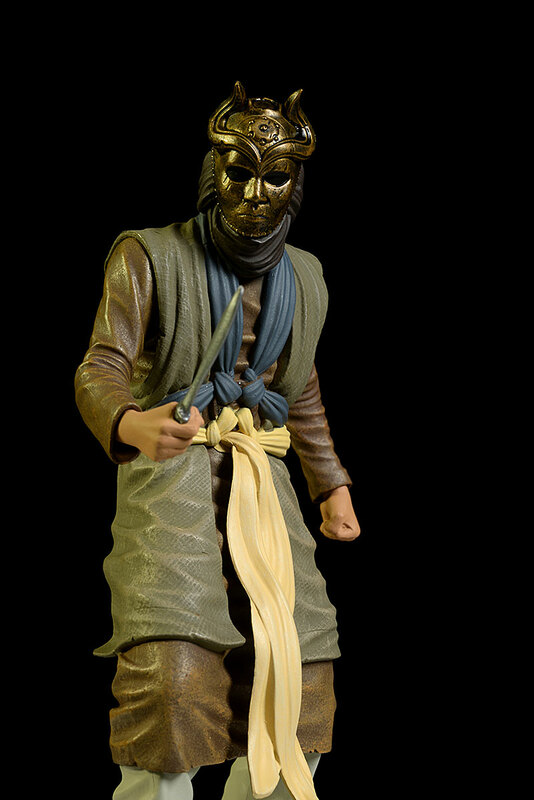 Which leaves fans with only one real, consistent option: Dark Horse's series of 'action' figures. I'm using the quotes here because there is NO action. These are Nerd Hummels, plain and simple. But they're quality Nerd Hummels at a good price, and they cover the world of Westeros and Essos with variety and speed. 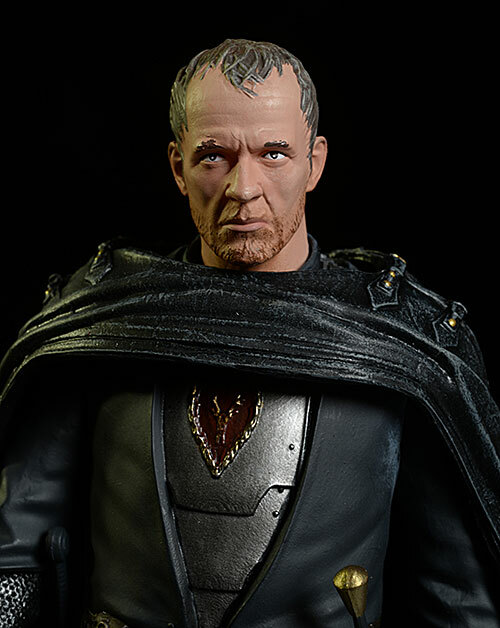 The latest releases are a Son of the Harpy and Stannis Baratheon. The Son of the Harpy started shipping a few weeks ago, and Stannis is a brand new release. They'll run you $22 - $25, depending on the retailer. Each package is slightly different than the other, at least when it comes to the interior. The exterior shows off graphics from the show, as well as basic information. The large window in front gives you a great view, and the window in the top lets in enough light to make that view useful. The Son of the Harpy package is quite collector friendly, with no twisties or other hindrances. The shape and design of the tray holds the figure in place. 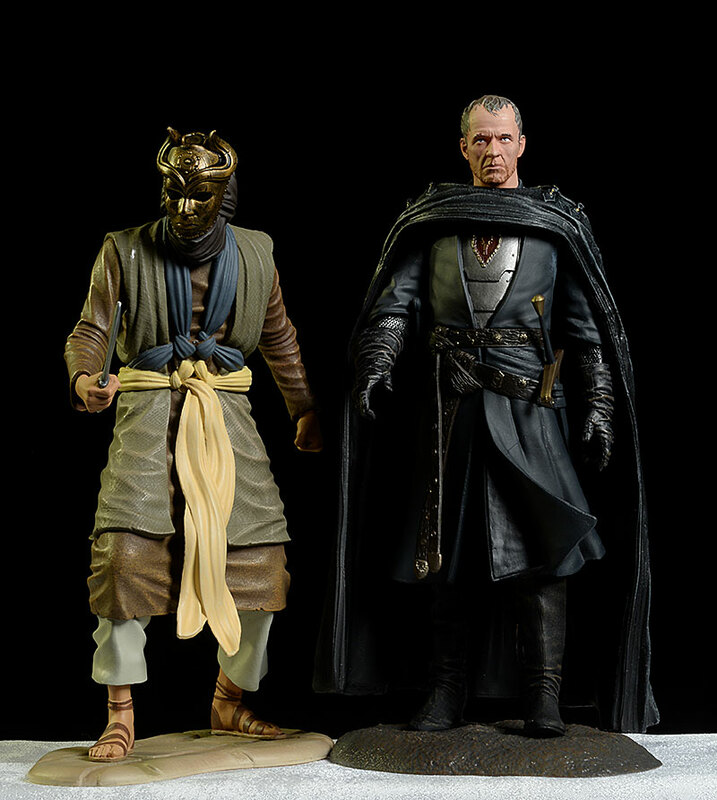 On the other hand, Stannis is a bit more traditional, with twisties on his ankles and torso keeping him trapped. I'm not sure why the difference, but it's worth noting. When comparing the Harpy, I used a couple different stills, but this one shows a lot of the mask detail. If you ignore the spike through his forehead. 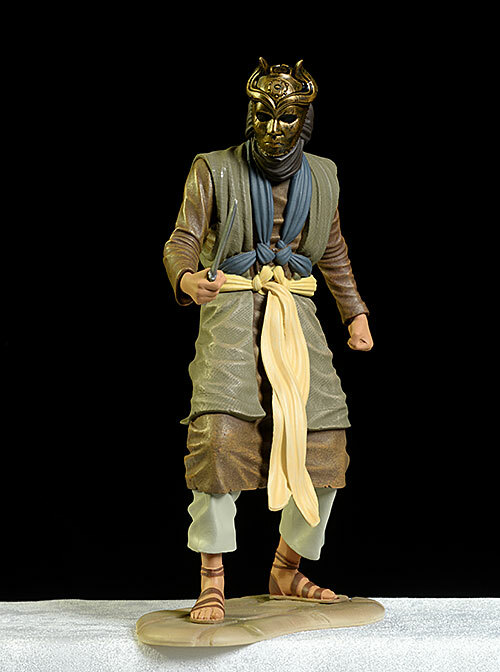 Considering the scale - remember, these are really a 1/9th scale, the Harpy, with his hunched pose, is about 7 3/8" tall - the detail work on the mask is quite good. The design matches up overall, and the horns and proportions look about right. The costume from the neck down has folds and layers that look realistic, and the texturing of the sculpted cloth adds to that realism. 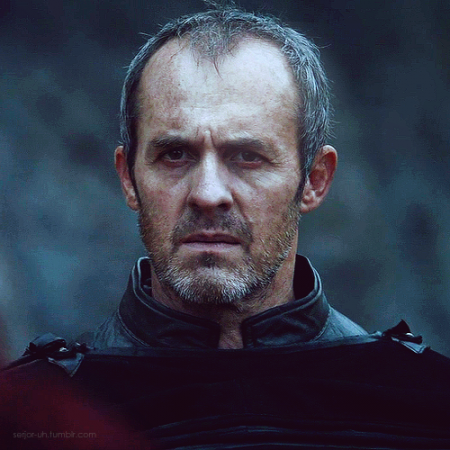 For Stannis, it was a bit trickier coming up with just the right stills. He's wearing his armor and heavy cloak, which was a later season look. But his beard isn't quite as thick on this figure as it eventually got, so I ended up settling on this head shot for comparison. Stannis is more difficult to capture, of course. A masked character is always easier - getting the right likeness on a human is less cut and dry. And Stannis changed over the course of 5 seasons, making it more difficult for them to get a look that is instantly recognizable to everyone. I think they did an admirable job, although the nose looks off to me personally. 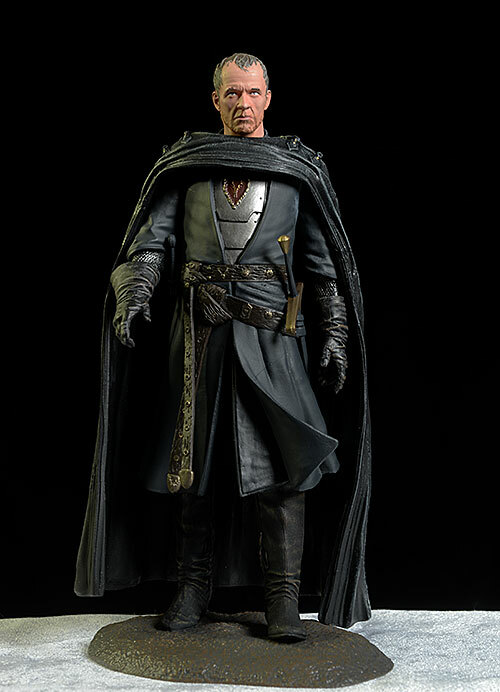 The expression is definitely him, and the detail work on the armor and cloak is great. That's not surprising for this line, where the sculpted costumes are always quite good. At this price point, the paint quality remains very consistent. The work on both figures is clean, with small details generally well done. The burnished bronze appearance of the Harpy's mask is perhaps his best quality. While the paint work on the body is clean, it's also very broad, with each piece of clothing being a little too consistent in color. There is some dry brushing though, giving the high points a slightly lighter color, and the colors are properly muted. The sandals are the only area where there's some actual slop around the edges, but it's relatively minor. In some of the photos you'll see a bright spot here or there on his clothing. This is a rub mark that creates a glossier finish, allowing certain spots to catch the light. This is the first time I recall seeing this particular issue. In hand, it's much less obvious of course. 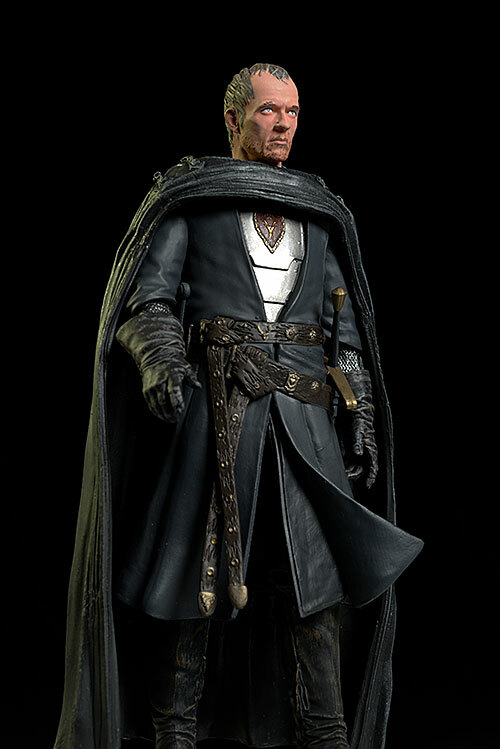 Stannis has the same great work on his costume, although it does seem a little less detailed than past releases. Still, there's enough small detail work to give him some visual pop, and there's very little slop. The face looks good, with clean, straight eyes and a nice transition between the facial hair, hairline, and skin. They've also used a different color for the hair on his head and the beard, which is fairly accurate. It's not perfect, but it's rare for a company to even attempt to match this particular reality. Overall, it's solid work. It won't wow you, but you won't be disappointed either. The price is starting to slide up a bit on these - I'm seeing them at $25 more often than $23. Hopefully that's not a trend, but for now, these remain a solid value in the market. Not a thing. Sturdy, well made, and consistent, there's not too much to worry about here. This is a 'working class' line. It's always solid, it's always consistent, it's always good quality. Nothing about it is going to blow you away, but there's nothing really off either, and this sort of consistent quality creates a very positive perception with collectors. To put it simply, it gets the job done. A big plus is the variety of characters they've produced, with little sign of the quality dropping off. With more than two dozen already released, you can create quite an excellent display. With a lack of collectibles based on the property, this is a great option for fans. - has them for $23 each. - Entertainment Earth has them for $25 each. 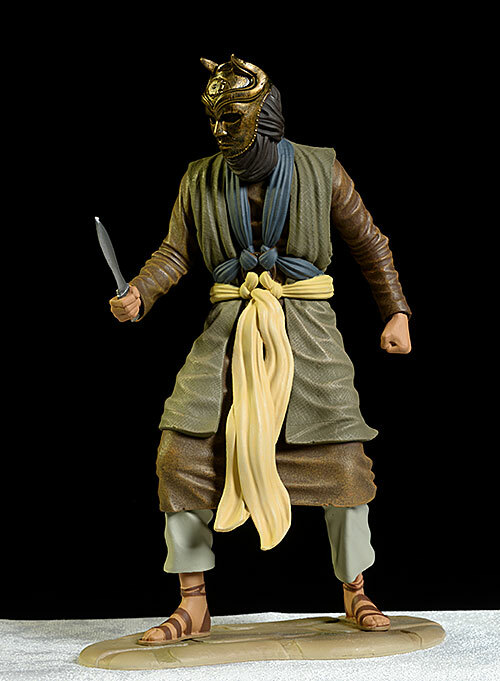 The last Dark Horse GoT figure I covered was Varys. Others include Grey Worm and Margaery Tyrell, Oberyn and Ygritte, Sansa and Jorah, Breinne and the Hound, Bran and Hodor, Joffrey, Tywin and Petyr; earlier in this Dark Horse series I covered Cersei, Jaime, the White Walker, Robb and Arya, as well as their Daenerys, Drogo, Ned Stark, and Tyrion Lannister. They've also done Jon Snow, but I don't have a review of him. Funko did Jaime and Brienne, Arya and Robb, and the second release of Danaerys, along with her beau Drogo. Before that we had the Walgreen's exclusive Tyrion, Daenerys, and I reviewed the first wave of figures in three sets, here, here and here. 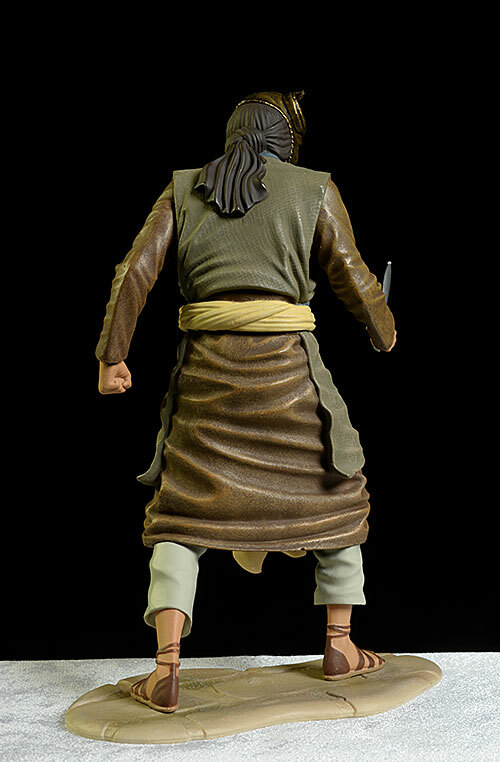 Perhaps the best of the bunch is the sixth scale Tyrion, Ned Stark, Jaime, and Jon Snow from ThreeZero. 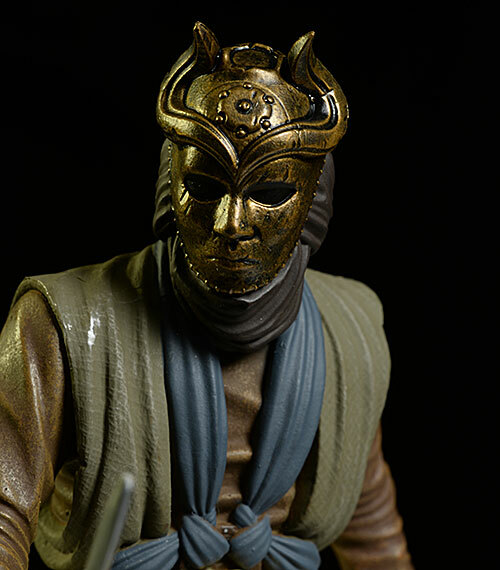 Other Game of Thrones collectibles I've covered include the Daeny bust from Dark Horse, the Hand of the King pin, and the Catspaw Blade from Valyrian Steel.